…The Kid took her time and carefully selected a few pieces which were placed in a little bag, about 150-200 grams worth. 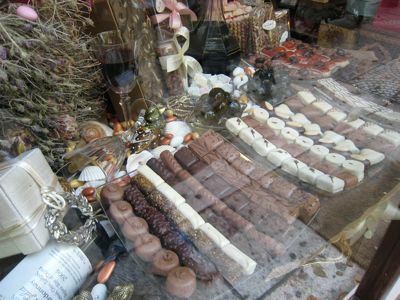 These chocolates were also delicious and accessible, but definitely less sophisticated than those at Aristokratikon…. I felt the same “happiness” when i was at the Godiva store in HK. 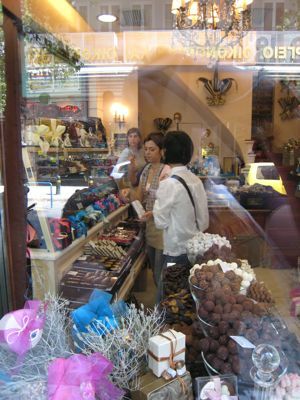 I wanted to sample all kinds chocolates. MM, what brand will you compare the taste of Le Chocolat? Monsters inc., actually, I never got to taste one… the kid must have consumed them all by herself… :) jenny, I didn’t get a photo, but it was a few assorted pieces of choc. I’ve been a long time lurker of your site but when my hubby said that we’ll be heading to Athens this coming September, I can’t help but be grateful for all the tips. I’m much more excited to go to Greece now that i have read all about your trip. Keep posting your great finds in Athens! thanks again. since this shop has opened I have not stepped inside. So far I have been home a total of 5 days this year…. got ticket mid Sept… time to check what I am missing in Athens. 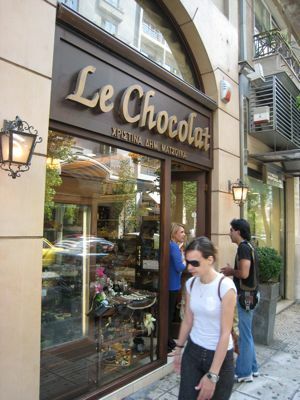 Athens or not, I have to have chocolate today.I bought chocolate covered almond just to satisfy my cravings. Tricia, hello?! I am shy a few pounds from 200! :) If only I could shave 25 pounds! 12.12 – 1 Holiday Sweets! !